The historic low of Colombia’s peso against the dollar reached on Tuesday is not the end of the Colombian currency’s year-long decline. However, the drop is not infinite either, analysts said Tuesday. For the first time in history, one US dollar now costs more than COP3,000. The same currency was worth COP1,880 a year ago, meaning the Colombian peso lost almost 40% of its value in just 12 months. While the peso is expected to decline further, the dollar is not likely to exceed COP3,200, analysts told Colombian economic newspaper La Republica. There is little Colombia’s government or central bank can do to curb the growth as it is not just the Colombian peso that’s dropping, the US dollar has also gained value compared to other currency, for example the euro and the Brazilian real. The main reason for the peso drop has been the drop in global drop in oil prices. However, Europe’s problems with Greece, a slow-down of the Chinese economy and an increase in US oil production through fracking have all contributed to this drop. Oil has lost about a third of its value since June and prices have been hovering just above six-year lows for the past week. The downward trend has been driven by global oversupply and record stockpile levels, analysts told Reuters news agency. Many analysts told the agency they expect some temporary price stabilization as people take profits from short positions. But they said the downward price trend was likely to continue unless there was a significant reduction in global supply. 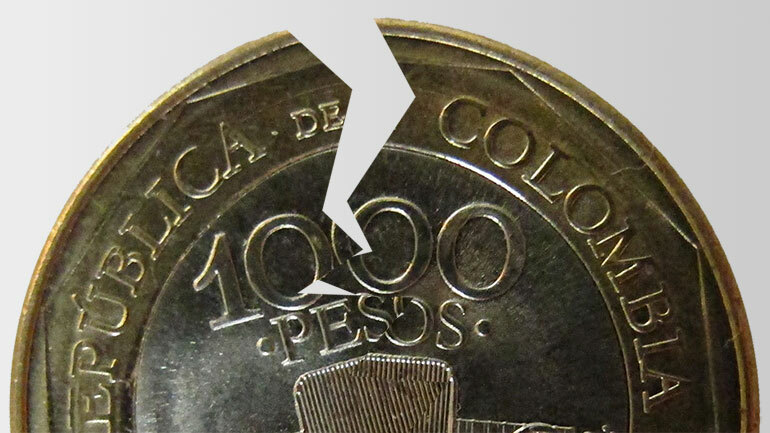 And with that, the peso is likely to lose value, Colombian analysts said. “It’s the natural reaction of the markets,” former Finance Minister Roberto Junguito told La Republica. The value of Colombia’s peso “depends on the oil prices. They are not independent from the currency exchange rate. If [oil prices] continue to lower, but constantly, the depreciation should not be too much. But if they continue falling like this, the dollar is certainly going to become stronger,” the former minister said. With the US’ oil demand likely to drop some in September, Colombian economists expect oil prices and the Colombian peso to depreciate further accordingly with an expected peak of one dollar against COP3,200. “However, we expect that on the medium term there will be a correction and that currency will position itself between COP2,800 and COP2,900,” said Global Securities analyst and economist Daniel Escobar. And when Colombia runs out of oil? One side effect with long-term consequences is that investment in the oil industry has also dropped significantly, reducing the possibility Colombia will find new oil wells before its current wells dry up around 2020. “Colombia requires an urgent crash plan to significantly increase [oil] exploration. If the industry doesn’t do this, they can’t increase the reserves of petroleum that they need to achieve the fiscal stability of the country,” Francisco Lloreda of the Colombian Petroleum Association told Portafolio magazine last year. The country’s government has proposed to begin fracking in order to push away the country’s oil expiration date, but this is highly controversial because the country is located on numerous fault lines that could cause major earthquakes and even volcanic eruptions if disturbed by the controversial mining method. A long-term reduction in oil revenue will affect how much the country can invest in diversifying the economy and its export sectors in preparation of a post-oil period. If at that point more than half of Colombia’s total exports come to a halt, there is no saying what the consequences will be for the peso and Colombia’s inflation rate, which generally speaking goes up when the peso goes down.